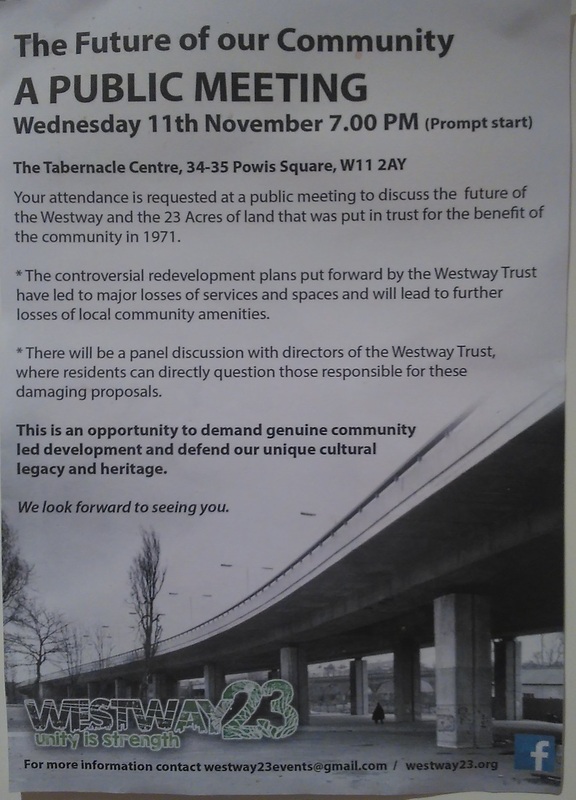 9th November, two days before the Westway23/Westway Trust public meeting at the Tabernacle, text message Tom to Angel Lewis: “WT have now pulled out saying they couldn’t guarantee the safety of their staff”. Reply: “That’s what a guy handing out flyers just told me”. We were forwarded an email exchange between the parties that confirmed that Westway Trust had decided not to participate, one of the reasons being cited was indeed the “well-being” of the WT staff, and they had instead suggested meeting a small group from Westway23 in order to provide more detailed responses to their concerns. No explanation for the sudden security concerns was given, nor was an apology. Toby Laurent Belson, Artist/Designer/Organiser at Westway23 told Urban Dandy: “It is a degrading statement for them to make. I am personally insulted by the suggestion that any member of the Westway Trust would be unsafe in the midst of a community meeting I have been a part of organising, taking place at one of this area’s most venerated and well-run venues. I have attended countless meetings in this community in which I have only ever seen a put-upon community respond to issues with consideration and passion”. He explained that W23 still received no apology. “Neither myself, nor any other member of Westway23 or its supporters, have received any reasonable explanation, let alone an apology for it, despite clearly communicating the distress it has caused”. We asked Councillor Pat Mason, who is the Labour Group’s representative on the Westway Trust board, what he made of the no-show decision and whether it was symptomatic of a deeper malaise at the Trust. He told us: “I advised the trust Chair and Chief Executive to attend the Westway23 Tabernacle public meeting, saying they should not operate in a vacuum without the input of local people and without giving people the right to ask questions, scrutinise their actions, and to suggest what strategies the trust should follow for the future. “Unfortunately, they decided not to attend because they are locked into the belief that local people should be commenting on and suggesting improvements to the trust’s proposals and strategies, rather than accepting that local people do not support what they are doing and have a completely different vision for their area. So any kind of strongly-voiced opposition to what is being proposed is experienced as unpalatable by trust directors”. “This disconnect with the community is a historical problem born from the hijacking of the trust by Kensington & Chelsea Council from its inception and used as a vehicle to advance Council regeneration policies and to prevent real community representatives and groups, who were always branded as trouble-makers, from managing their own assets and making decisions beneficial to their communities. For several decades, the trust has been run as if it were a castle bordered by a moat and peopled by the Council’s grandees who have ingrained their philosophy of neo liberal top down decision-making on the organisation which is a hard mould to break. The trust now has less Community representatives and elected Councillors, and more professional appointees on its board than it had a year ago. It was set up to go down the corporate route and that process will continue unless the local community backs up its wish for an alternative vision with real actions”. Westway Trust send Urban Dandy this statement: “We took the difficult decision to withdraw our attendance from the meeting organised by Westway23 as we believed attending would not lead to constructive outcomes. It is unfair to expect someone to attend a meeting not knowing who is presenting alongside you, what the agenda is, who the audience is, who is facilitating or how it will be managed. Having a community meeting is very positive and we support the principle, if you know the details and what to expect. We were informed about some of the details of the meeting from the Press ahead of being told by the organisers. There was always an air of mystery to the meeting, which did not encourage staff to feel confident about attending. Westway Trust regularly liaises with more than 70 local groups and working with a small group of leaders, who have proposals to discuss, has proven to be the most productive way to make progress. We remain keen to have a meeting with a group representing Westway 23 at their earliest convenience. W23’s Toby offers a different route forward: “At some point an organisation set up to consider and listen to the community must do just that. It cannot continue to play politics and bury its head in the sand as people’s lives are threatened ever more seriously by economic and environmental realities. It cannot continue to treat people as idiots on the subject of their own lives. Wounds, injuries, pain and injustice do not disappear through ignorance or denial. They only bury deeper and spread wider. Without beginning a fundamental process of healing and reparation, the damage simply continues down through generations. In my opinion, that is what we are seeing here and a genuine healing process is what Westway23 have been set up to assist our community in going through. We are trying to be open and honest and shine a light on uncomfortable truths that will hopefully reveal a better, healthier, more nourishing future. I hope the Trust can come around to being a part of that future and put the skills they do have behind those of the local community”.